While the island of Santorini isn’t huge, it mostly requires getting around by bus, car, atv, or motorbike. I always prefer to use my feet so when I learned of a walking path from the main city of Fira to the town of Oia, I couldn’t resist. The short three or so hour walk starts in busy, tourist filled streets, travels quiet pathways and ends in picturesque surroundings. 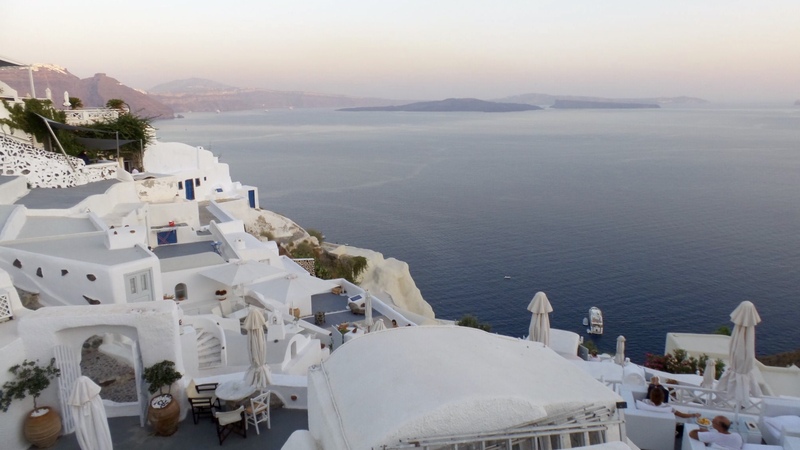 The goal is to reach Oia in time for its famed sunset. In Fira, the narrow cobble walkways are packed with people shopping and eating. Restaurants cling to the cliffs offering beautiful views. Once through the maze, past the crowds and thousand souvenir shops, the path calms along the edge of the island high above the sea. Looking back on Fira, you see the sprawling white spilling down against bright blue water and rocky cliffs. The view is spectacular. The path continues past a few smaller villages with infinity pools attached to posh hotels. Classic Santorini architecture of rounded roofs and smooth edges flow atop jagged, steep inclines. Small, pretty churches speckle the land. Past the villages the path opens up under the intense Santorini sun. The stone walkway dissipates into sandy volcanic rock. The smells of herbs growing from the dry land intensifies. The view widens to sweeping panoramic scenes of the sea all around from the most narrow point of the island. The white of the buildings is replaced with black ground, yellow and purple plants, and porous walls of beige. As the sun begins to set, reflections from the blazing star illuminate the whites, the rocks exude a deep red, and the sky turns an ombre of golden-yellow, pink and orange. Just for a moment, as though melting into each other, the earth and sky feel as one. Like a fire burning out, the sun falls behind the horizon in a dramatic descent. Crowds, twenty people deep, gather to watch the day end and the lights of Oia turn on. I sat tucked into a dark corner with a cold beer after the hot, long walk, watching the mobs escape the streets and retreat to small tavernas and hotel rooms, happy and relaxed in the night of the lit up town.